Felt like some makeup should be added. Textures were easily added to landscape, and it is looking good. Figuring at least couple of different should be used (snow/ice, desert, grass, earth, stones). Also, fancy semi-transparent clouds have been now generated, dropping a lovely dynamic shadow on both land and sea. But. I found my game moving too much to realistic look and feel and away from cartoonish like, which I think I want. Not sure “wat do”. Found a great article on cartoon like GL rendering and thinking about maybe using it. 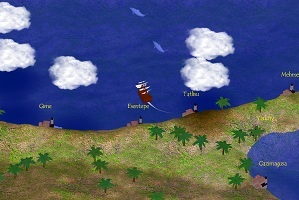 Also, sea and cannon trails are now implemented, using 10 last server points. It looks good, but animation is kinda jumpy. Either way still wondering about pure sea effects, should it be random waves animated textured polys just scattered around, or should I use one large pseudo shading animated caustic map….